Any impact on the budget debate? The second release by Istat of 3Q18 Italian GDP data offered an even bleaker picture of the state of the Italian economy. In 3Q18, Italian GDP actually contracted 0.1% QoQ (vs a flat preliminary reading and +0.2% in 2Q18), posting the first negative reading since 2Q14. The year-on-year measure, better suited to monitor trend developments, also slowed down to 0.7% (from 1.2% in 2Q18). The supply side of the equation shows that value-added contracted both in industry (-0.2% QoQ) and in services (-0.2% QoQ), while expanding in agriculture (+1.6% QoQ). While the headline number was concerning, the relevance of today’s release really lies in the demand breakdown, which wasn't disclosed at the preliminary stage. This shows that the single positive driver of quarterly growth came from net exports (0.1% contribution), while domestic demand net of inventories subtracted 0.3%, driven by investment (-0.2% contribution). Private consumption, public expenditure and domestic demand all proved growth neutral. Given the recent soft manufacturing data and concerns about future fiscal policy, a soft private investment reading was not unexpected, but private consumption was disappointingly weak. True, employment data had clearly been signalling a stabilisation rather than further gains, but a small revival in hourly wages (admittedly driven by the unfreezing of public contracts) and resilient consumer confidence data had fuelled hopes for a modest gain in private consumption. Looking at possible 4Q18 growth developments, there are few obvious reasons to expect a turnaround. While in principle, fading temporary factors which negatively affected the German economy might provide some support to the export channel, the domestic demand front is unlikely to bring about big positive surprises. Business confidence has been declining in both October and November, more markedly in the services sector, typically related to domestic demand. This was well mirrored in the October PMI data, which contracted both in manufacturing and in services. Furthermore, the persistent BTP-Bund spread widening to the 300 basis point-area is now starting to filter into lending activity and might soon translate into even softer investment activity. Official data for September showed that bank lending rates increased only marginally but the October Bank Lending Survey shows a clear tightening of term and conditions for loans and credit lines to enterprises. On the back of today’s data, we revise our forecast for Italian GDP growth (calculated on seasonally- and working day-adjusted quarterly data) down to 0.9% for 2018 and to 0.8% for 2019 from 1% and 0.9%, respectively. The latter, which follows purely on statistical carryover grounds, is exposed to downside risks. Today’s disappointing GDP data will inevitably feed through to the ongoing debate on the budget between the Italian Government and the EU Commission. Optimistic growth assumptions in the budget draft (+1.5% in 2019) were part of the Commission’s critique. Today’s GDP reading makes the government growth target even more distant. There have already been signs that the government may be open to possible amendments to the budget draft to include more growth initiatives, with a limited trade-off on the delivery of early pensions and citizenship income. 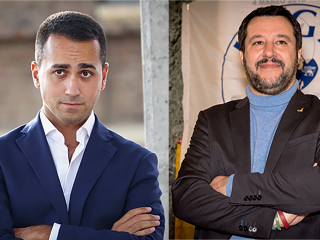 We believe today’s data might eventually help Deputy Prime Ministers Matteo Salvini and Luigi Di Maio to defend such a move with their electorate. Time is running out, as the budget will have to be approved by the Italian Parliament before the end of the year. We still believe the Commission will give the Italian government the necessary time and that it will not try to force the start an excessive deficit procedure before 22 January.